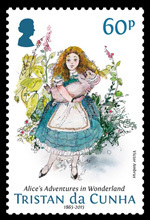 These stamps celebrate 150 years since Alice's Adventures in Wonderland were published by Lewis Carroll (real name Charles Dodgson). The author's brother Edwin Dodgson was the missionary teacher on Tristan da Cunha during the 1880s. 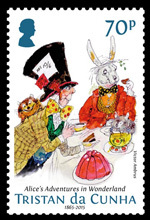 2015 sees the 150th Anniversary of the publication of Alice's Adventures in Wonderland. 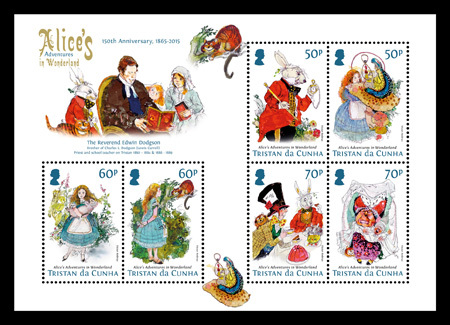 Written by Charles Lutwidge Dodgson under the pseudonym Lewis Carroll it is the story of a girl named Alice who falls through a rabbit hole into a fantasy world populated by peculiar, anthropomorphic creatures. 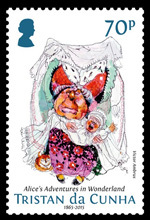 At the time of its publication it generally received poor reviews although it is now considered to be one of the best examples of the literary nonsense genre. 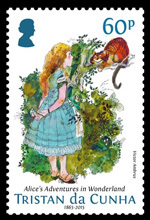 Its popularity increased with the release of Through the Looking-Glass and, by the end of the 19th century, Sir Walter Besant wrote that Alice in Wonderland "was a book of that extremely rare kind which will belong to all the generations to come until the language becomes obsolete". Alice's Adventures in Wonderland by "Lewis Carroll" with illustrations by John Tenniel was first published in 1865. 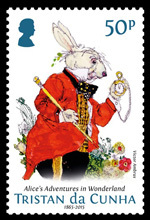 The first print run of 2,000 was held back because Tenniel objected to the print quality and a new edition was quickly reprinted and released in December of the same year, but carrying an 1866 date. The entire print run sold out quickly. 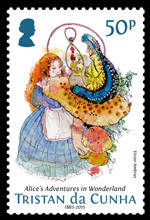 Alice was a publishing sensation that could be enjoyed by children and adults alike. Among its first avid readers were Queen Victoria and the young Oscar Wilde. The book has never been out of print and has been translated into at least 174 languages. Dodgson's family was predominantly northern English, conservative and High Church Anglican. When he was 11 his family moved to the rectory in Croft-on-Tees in North Yorkshire, his father being Rector of Croft and Archdeacon of Richmond from 1843 to 1868. This remained their home for the next twenty-five years and was where his youngest brother, Edwin Heron Dodgson was born. After a brief period of work for the Board of Trade Edwin entered Chichester Theological College in 1871, was ordained deacon in 1873 and priest in 1874. After various ministries Edwin was appointed as Principal of the (UMCA) Kiungani School in Zanzibar in 1879. However, as his brother Charles noted, "the ague (Malaria) was too much for him there". In 1880, with a stipend of £100 a year, he was appointed by the Society for the Propagation of the Gospel (SPG) as missionary and school teacher to Tristan da Cunha; a post which the Bishop of St Helena had been attempting to fill since 1866. Tristan da Cunha is the most isolated human community in the world. At that time the population was around 100 and there was no regular transport to the island. He landed safely on 25 February 1881. However a gale blew up wrecking the schooner Edward Vittery that Edwin arrived on and he lost all his books and most of his stores and clothing. This spot is now known as Down-Where-The-Minister-Land-His-Things. With great effort he set about his major tasks as priest and school teacher and his reports to England reflect his enthusiasm and energy. In 1882 the Admiralty diverted HMS Diamond to Tristan to deliver books, school materials and a harmonium. However, Dodgson was to lose his optimism and felt that the isolation of the islanders was to blame. He served as the priest in Tristan from 1880 to 1884, when Bishop Thomas Welby of St Helena granted him permission to return to England, having heard from a whaling captain of his "very depressed state of mind". He arrived back in England in February 1885. In England he continued to work for the well-being of the people of Tristan and he was ably assisted in this by his brother Charles. In 1885 fifteen working men, a large portion of the adult male population of Tristan, perished in what has come known as the Lifeboat Disaster of 1885; an unprecedented disaster commemorated in Tristan's previous issue. When Dodgson learned of this he actively sought to aid the surviving inhabitants and the Colonial Office paid for his return to Tristan da Cunha on board HMS Thalia. He arrived on the island on 4 August 1886. "I think it is my plain duty to throw in my lot with them and minister to their souls", he wrote. He remained at Tristan, for a time without any stipend, until December 1889, when again he had to return to England because of poor health. Once again he had become quite depressed about the isolation of the islanders. Edwin Heron Dodgson died at The Chestnuts, Guildford. His grave is in the Mount Cemetery in Guildford. He never married.